The contribution rules of our paper was formed based on 『Uniform Requirements for Manuscripts Submitted to Biomedical Journals』 that editorial board of international medical academic journals prepared and the details not stated on the following shall follow the general rule of above form. The qualification of contributor shall be a member of The Society of Korean Medical Ophthalmology & Otolaryngology & Dermatology as a general rule. But except for cases of being requested or approved at the editorial board committee. The oriental medicine related original articles, reviews, clinical and case reports or brief reports, etc. shall be published on our paper. All papers will be determined whether to be published by going through deliberation of editing committee after being examined by a number of judges requested by editing committee. The publication order of selected draft will be determined by editorial board. For all manuscript except requested manuscript, fixed amount of examination fee and publication fee may be received and it must be deposited when submitting thesis. Examination fee and publication fee are each 60,000 and 200,000 won and design fee or cost required for special printing should be paid by writer for its actual expenses. Also if extra supplement production is desired, author separately covers the expense for production. Various inquiries related to sending and editing draft must be perform at the editorial board. The editorial board may request corrections to writer on style and amount draft and the expressions or system, etc. may be corrected within the rage of not influencing the draft by the decision of editorial board. All drafts are not returned after being submitted. The copyright on all drafts published on our paper is owned by The Society of Korean Medical Ophthalmology & Otolaryngology & Dermatology. ① Every draft received is circulated to three peer reviewers. ② The author's name and affiliation is not disclosed during review process to reviewers. ③ The review process can be repeated till three times if the request of revision is suggested by reviewers. ④ If two reviewers do not agree to accept the journal, it may not be considered for publication. Usually the first review process ends within one month. ⑤ Statistical Review : If there are any complicated statistical analyses in the draft, it may be reviewed by statistical editor. ⑥ Manuscript Editing : The finally accepted manuscript will be reviewed by manuscript editor for the consistency of the format and the completeness of references. The manuscript may be revised according to the opinion of the manuscript editor. Our paper is published 4 times a year(February 25, May 25, August 25 and November 25) and received by editorial board at all times throughout the year at editorial board. The submitting date of draft shall be the date draft was submitted at the editorial board and the selection date of draft shall be the dated when the corrections have been completed after examining. The original file(HWP file) must be written on A4(210×297㎜) white paper with a space of more than 25㎜ from upper, lower, left and right margin. Always submit your draft in the Hangul(*.hwp) format. The text of the draft must be double-spaced(160%) and in standard 10-point font. All pages should be numbered consecutively starting with the title page. The original file for examination must not include the name and affiliation of writer, acknowledgement and research expense support. If the draft is approved, the writer may contribute the final version including these things. 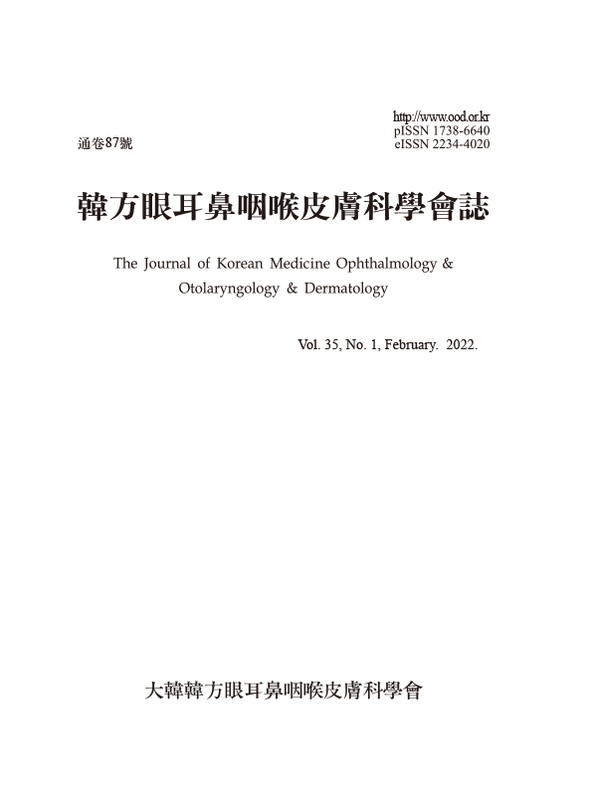 The Society of Korean Medical Ophthalmology & Otolaryngology & Dermatology. San 45-1 Yangjeong-2dong Busanjin-gu, Busan, 614-710, KOREA. The amount of draft shall be not exceeding 15 pages with A4(210×297㎜) white paper. The writer shall pay for expenses limited to the exceeding amount of draft. The order of thesis should be in the order of title page, abstract, key words, texts, acknowledgements, references, (except for clinical & case report and reviews) while the text is divided into title, introduction, materials (subject) and method, result, considerations and conclusion (summary). On the title page 1) Brief Korean and English title communicating the contents well (All words must be capitalized except for prepositions and articles), 2) full name and affiliation of writer in Korean and English, 3) supporters of research expenses, etc, 4) Name and address, telephone and E-mail of corresponding writer should be written. When the Korean title exceeds 30 letters or English title exceeds 15 words, the running head is inserted separately on the title page (No more than 10 charaters in case of Korean and no more 5 words in case of English). was in charge of in the research. Abstract in English is used for Korean draft and abstract in Korean is used for Engligh draft. In the abstract, title, name of writer(in the order of first name-last name), affiliated organization name and contents of abstract are written and length of contents should be within 250 words for abstract in English or 400 letters for abstract in Korean. The abstract should be recorded in a form of Objectives, Methods, Results and Conclusions including the following details. ① Objectives : Describe briefly and clearly with 1-2 sentences on why this research was performed and what is the object to be accomplished. The objective recorded here must correspond with title of draft and details stated in the introduction. ② Methods : Describe specifically on what has been done and how in order to accomplish the objective describe in the first paragraph. What materials are collected, how these materials are analyzed and how bias was adjusted are recorded. ③ Results : The details on how the results observed and analyzed using the method described in previous paragraph were should be logically described while presenting specific data. ④ Conclusions : The result derived from the outcome of this research is described with 1-2 sentences and this must be the one corresponding the objective of research described in the first paragraph. The key words of thesis are marked as no more than 6 words at the bottom of abstract. At this time, the key words must use MeSH (Medical Subject Heading) listed on Index Medicus. When the word is oriental medicine terminology, oriental medicine prescription name or name of acupuncture, record by referring to WHO-IST and WHO international standard for acupuncturing parts. The text should be in the order of introduction, subject or material and method, consideration, conclusion and references while each item can be combined or omitted out of necessity. Clinical and case-report and reviews article may have different format. In the introduction, the objective of research and a brief background must be mentioned. The method should include subject such as animals for experiment, method, experiment tool (state manufacturer and model) and procedure, etc. while they must be described adequately and in detail for other researchers to reproduce in case of being performed using the same method and the statistical examination of result must be also recorded. The result should be recorded in the same order as the order of diagrams but must not write the table of text or data of illustration by repetition while only the important observation results should be emphasized and summarized. the consideration should be prepared based on new and important aspects of research as well as the conclusion from them, but the literary consideration irrelevant with result should be avoided. ① Terminology : Academic terminologies should be in Korean if possible and can be written in English or Chinese only in case there is trouble with translating them. ② Abbreviation : Only standard abbreviations are used. Avoid use of abbreviations in thesis title and abstract. When first using abbreviation in the text, state the formal name first and indicate abbreviation in the parentheses and then only abbreviation may be used. Avoid using abbreviation that is not generally used except abbreviatiosn for standard measurement units. ③ Indication of proper noun, numbers and measurements : Possibly use original language for name of person, region and other proper noun; arabic numerals for numbers; metric system for weights and measures. Record temperature in celsius and blood pressure in mmHg. Measurement of hematology examination and clinical chemistry should use metric system of International System of Units, SI. Leave space between measurement and numerical values and indication of units. ④ Name of medication : Use general name rather than product name by principle. However, if indication of product name is important for evaluation of result or trace result, it may be indicated. a. Name of herbal prescription should be written in Korean pronunciation in frist and in Chinese pronunciation by expressing uppercase only in first letter. Words that stand for ingredients such as soup, acid or pill sould be indicated by lower case letters after suing the hyphen(-). b. Name of herb should not only be indicated by herb medicine but with name, used parts, and process in appropriate English. Distinction of article in Korean text should be used in arabic numerals. Distinction of article in English text should be used in Roman numerals. Title of figures and tables are written in English and same rule is applied for contents within the table. In the title of table all the first letters should be written in capital letters excluding preposition and articles. Compose table without using horizontal or vertical lines. Give a number and brief title for table in order referred in the text and abbreviation cannot be used in the tile by principle. The explanation on category is inserted to footnote and not inserted to heading. Non-standard abbreviations used in tables are all explained in footnotes. In footnote, symbols are used for explanations and thy are used in the following order: *, †, ‡, §, ∥, ¶, **, ‡‡. Explanation of figure should be indicated in English as principle and the first letter should be written in capital letter and rest in small letters. All tables and figures (including photographs) must be less than 10 by principle and the exceeding expenses should be paid by the writer in avoidable cases. All references are prepared in English as a general rule. Reference citations ins the text should be made with consecutive superscript numbers in semi-parenthesis. In the References section, they should be listed in the order of citation within the text, together with the corresponding number. Abstract should not be used for references. English names should be written as last name first and the rest should be initialized. And the number of references should be 40 or less in case of original work and 20 or less for case report as a general rule. (But excluding the review thesis.) The form of writing a reference follows Vancouver group’s presentation. ① Acadecic paper thesis : Name of writer. title. name of magazine. publishing year;volume(No. ):starting page-ending page. Write last name first and write initials for the rest in case of having 6 or less writer while writing 6 people in order and mark ‘, et al.’ in case of having 7 or more writer. Next, write the title of thesis, name of academic paper based on abbreviation, publishing year, volume(number) and first page & last page of corresponding thesis. (e.g.) Kouda K, Tanaka T, Kouda M. Low-Energy Diet in Atopic Dermatitis Patients. J Physiol Anthropol Appl Human Sci. 2001;6(3):276-82. ② Books : Name of author. name of book. number of copies. place of publication:publishing company. publishing year:number of pages. (e.g.) Colson JH, Armour WJ. Sports injuries and their treatment. 2nd rev. ed. London:S Paul. 1986:155-6. ③ Chapter within book : Name of author. chapter name:name of book editor. name of book. number of copies. place of publication:publishing company. publishing year:starting page-ending page. (e.g.) Foster DW. diabetes mellitus. In:Fauci AS, Braunwald E, Isselbacher KJ, Wilson JD, Martin JB, Kasper DL, et al. Harrison’s textbook of medicine. 14th ed. NewYork:McGraw-Hill. 1998:2062-81. 6. Drafts other than Original Article General details shall be according to Original Article. Review article is consideration focused on specific title and published by requesting at the editorial board. ① The entire amount shall be prepared as 10 pages or less of A4 sized paper. ② The order of thesis should be A. Title, Writer(Organization, Name); B. English Abstract and Key Words (2 to 5); C. Introduction; D. Case; E. Consideration; F. Summary; G. Acknowledgements; H. References. ③ English abstract and summary shall be no more than 150 words without classification of category. ④ The consideration should be focused on specific pard emphasized by the case and lengthy literary consideration should be avoided. ⑤ The number of references should be no more than 20. The clinical album is to deliver the details through photographs and their explanation while this has the main purpose of education through photographs in contrast to the creative original article. The draft should be prepared within 1/2 page of A4 sized paper while the photo at the bottom of figure should be 4 or less and references should be 5 or less. General interest or personal opinions on specific trend of the field related to health should be described, the draft should be prepared within 4 pages of A4 sized paper and references should be limited as 5 or less. As the part written by getting comment request on specific thesis published on the journal, the opinion of academic society is not reflected. The draft should be prepared within 4 pages of A4 sized paper and references should be limited as 10 or less. Request is made related to the topic determined at the editing committee, the draft should be prepared within 4 pages of A4 sized paper and references should be limited as 5 or less. Constructive criticism or opinion is described on specific thesis published on academic journal within 6 months, the draft should be prepared within 1 pages of A4 sized paper and references should be limited as 5 or less.